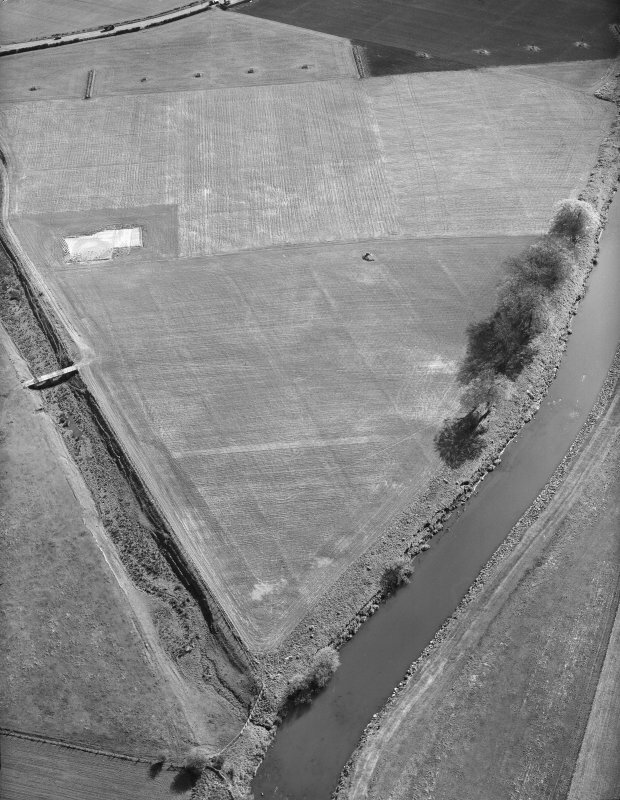 Oblique aerial view centred on the site of the Cat Stane. View of the Cat Stane with chalk enhancement. 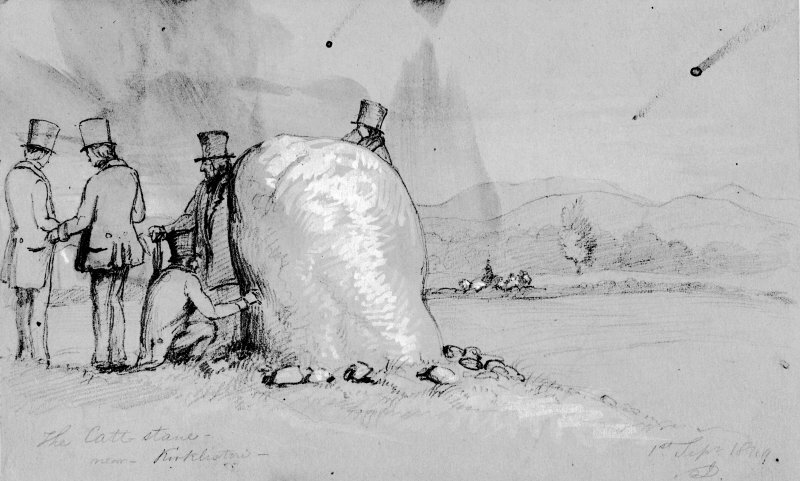 Photographic copy of drawing of the Cat Stane by J Drummond. Inscr: 'The Catstane 14th April 1860'. 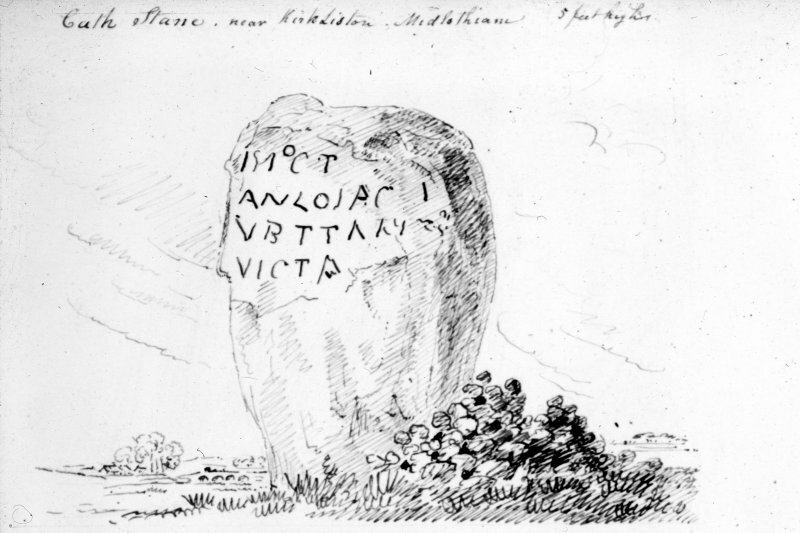 Photographic copy of drawing of the Cat Stane by J Drummond. 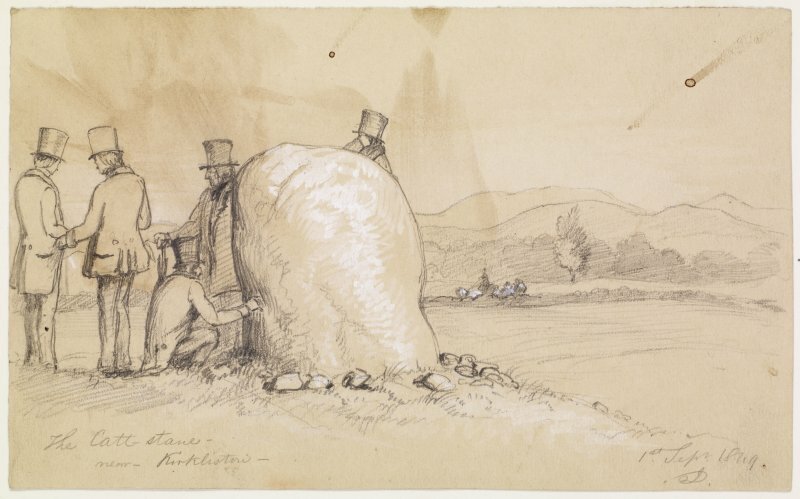 Inscr: 'The Catt Stane near Kirkliston, 1st Sept 1849'. Digital copy of drawing of the Cat Stane by J Drummond. 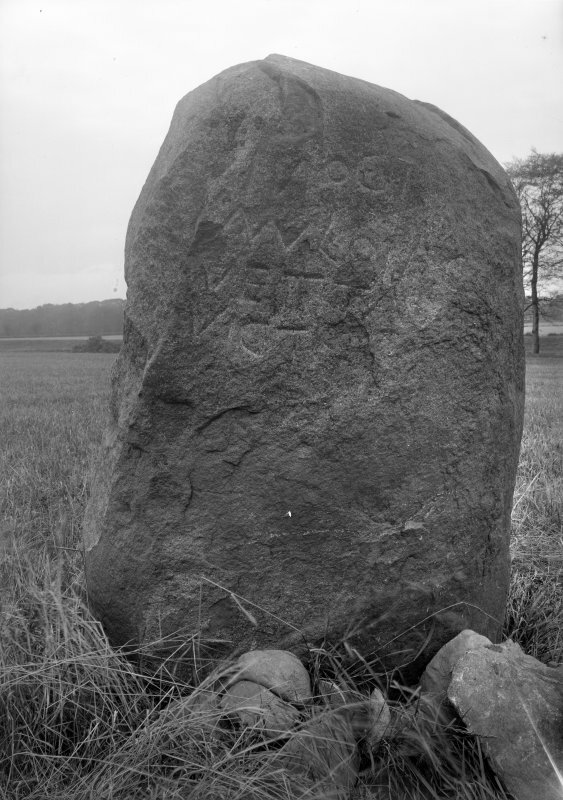 View of inscribed east face of the Cat Stane. View of the Cat Stane. Scanned image of drawing of the Cat Stane. 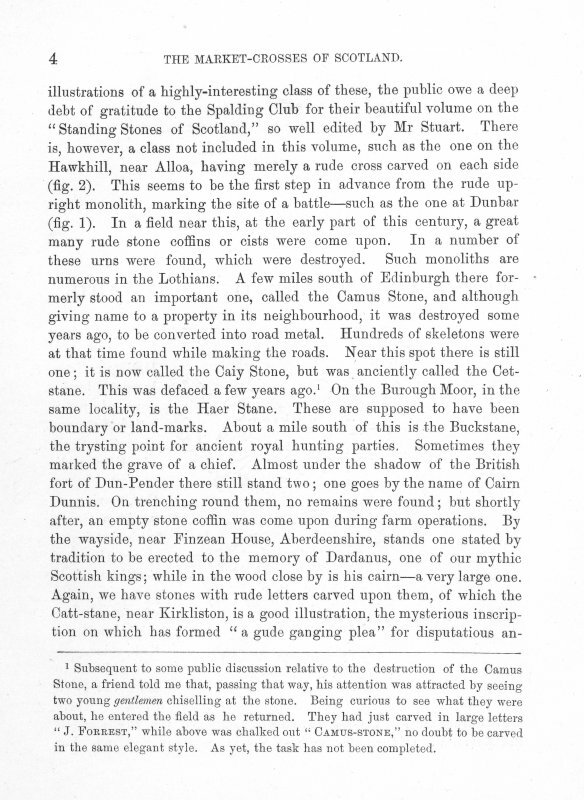 Inscr: 'Remarkable ancient stone, on the Kirkliston road, called the "Cats Stane", from nature by A Archer July 1836'. Slide copy of drawing from album. Copied 1977. View of excavation by T Cowie. Drawing of the Cat Stane from album, page 2. Digital image of MLD/14/5. 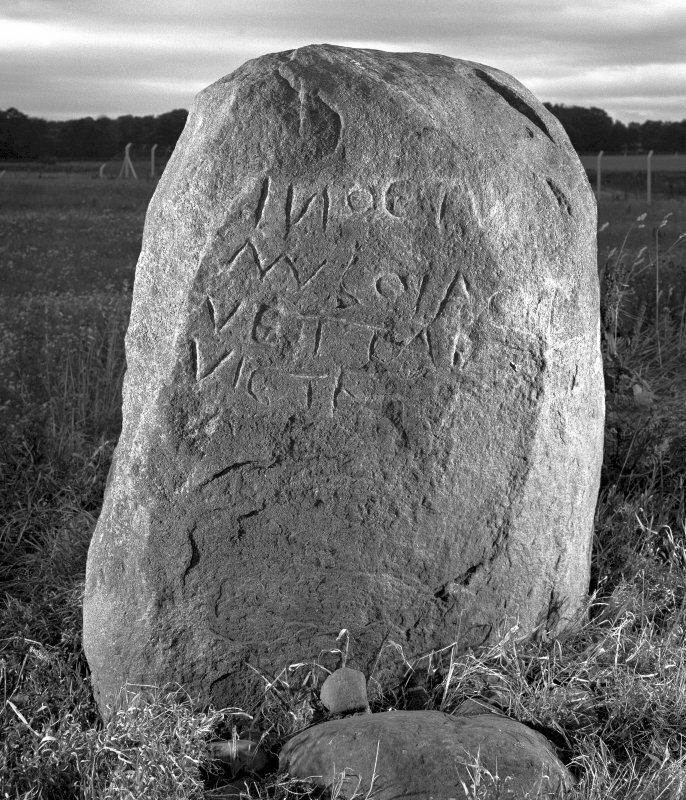 In the middle of the first millennium AD the Catstane, a standing stone, acted as the focus for a cemetery of long-cist burials, and it is remarkable for the inscription it bears, which has been translated as 'In this tomb lies Vetta, daughter of Victricus' written in a script dated to the 5th or 6th century AD. It has been suggested that, originally, the stone formed part of a Bronze Age burial site, subsequently reused over two millennia later. Present location: on the north side of the main E-W runway of Edinburgh International Airport. Evidence for discovery: first recorded in 1699 by Edward Llwyd and still in situ. The stone is thought to be a re-used Bronze Age standing stone. It became the focus for a large cemetery of burials in long cists. 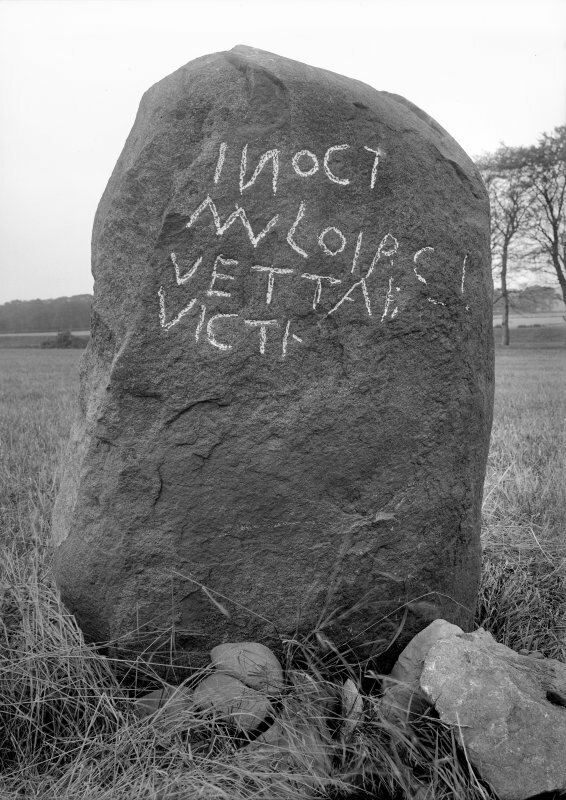 This rounded boulder bears on its east face an inscription in debased Latin capital letters, which reads ‘In this tomb lies Vetta, daughter of Victricius’. Date: late fifth or early sixth century. References: ECMS pt 3, 426-7; Rutherford & Ritchie 1974; Cowie 1978. See also NT17SW 2 (long cist cemetery) and NT17SW 3. The Catstane is a rounded boulder, irregularly trapezoidal in cross-section, with a girth at base of 3.65m, standing 1.3m above ground level. 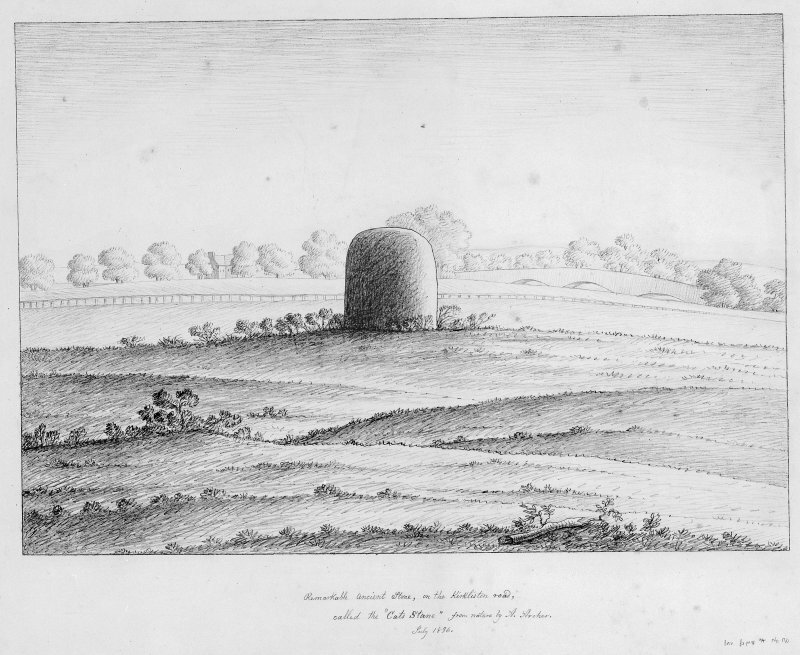 Judging by sketches made by James Drummond in 1860, it tapers in concave fashion below ground level, but it is not known whether it was deliberately shaped in this way. Its E face bears an inscription which now reads: IN OC T / MVLO IAC T / VETTA F / VICTR in a style of lettering suggestive of a late 5th or early 6th century date. 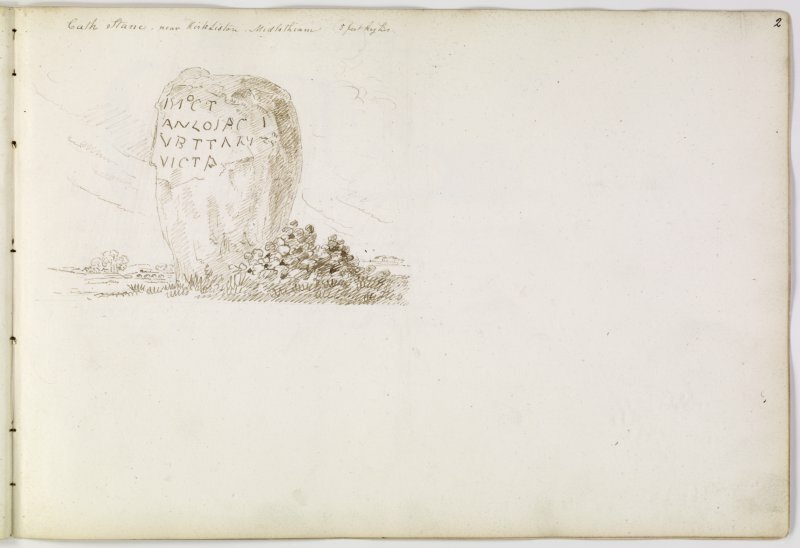 A tentative reading of the inscription is, "In this tomb lies Vetta, daughter of Victricius". 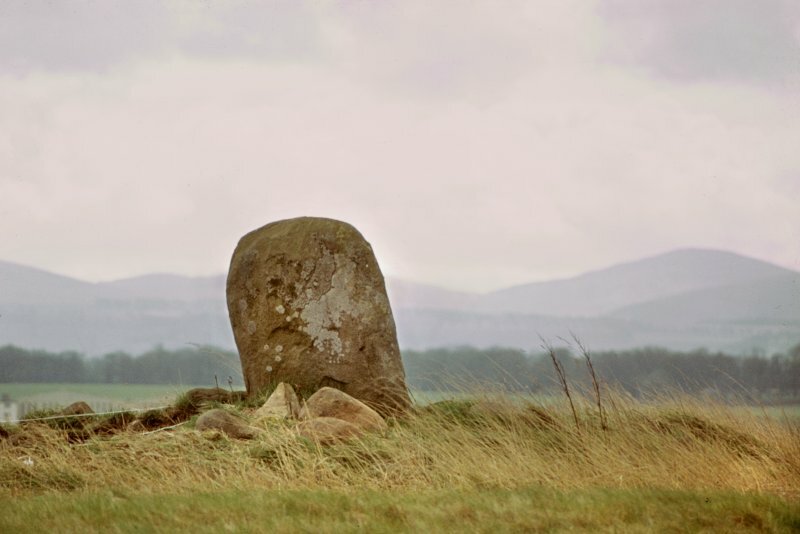 Though there are now no surface remains apart from the Catstane itself, there can be no doubt that it stood on the perimeter of a low cairn with large horizontal kerbstones (seen by Lhwyd in 1699). The diameter of the cairn was "about seven yards" (6.4 m)) and the kerbstones "laid lengthwise, except one larger than ordinary, which is pitched on end" (the Catstane). A drawing in the British Museum (Stowe MS 1023, f 19r, p.27) shows the Catstane on the perimeter of an oval of much smaller stones but there is the implication that those on one side are "laid lengthwise" as Lhwyd described. The measurements of the setting, however, are considerably larger than those originally recorded and below the cairn the dimensions are given as "14 paces long, 12 broad". The presence of one upright stone on the line of the kerb of a small cairn is unusual, but it can be almost exactly paralleled at Cairnpapple (NS97SE 16). Further information about the monolith depends on the interpretation of various excavations undertaken round it; Simpson and Hutchison did some small-scale digging in 1860 and found that it was buried to a depth of about 0.9m into the ground. "It was placed upon a basis of stones, forming apparently the remains of a built stone grave, which contained no bones or other relics, and that had evidently been searched and harried". 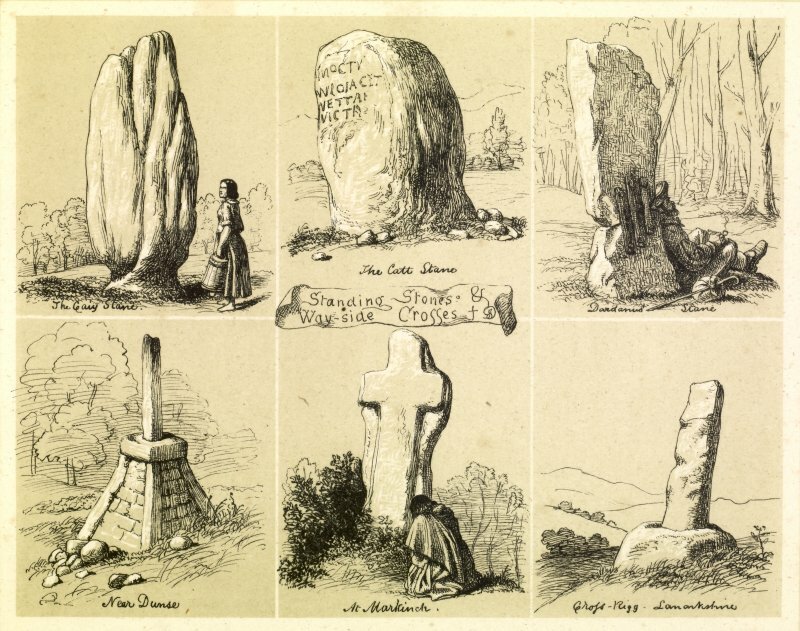 The accompanying drawing and Drummond's original sketches throw some doubt on the precise form of the "built stone grave". 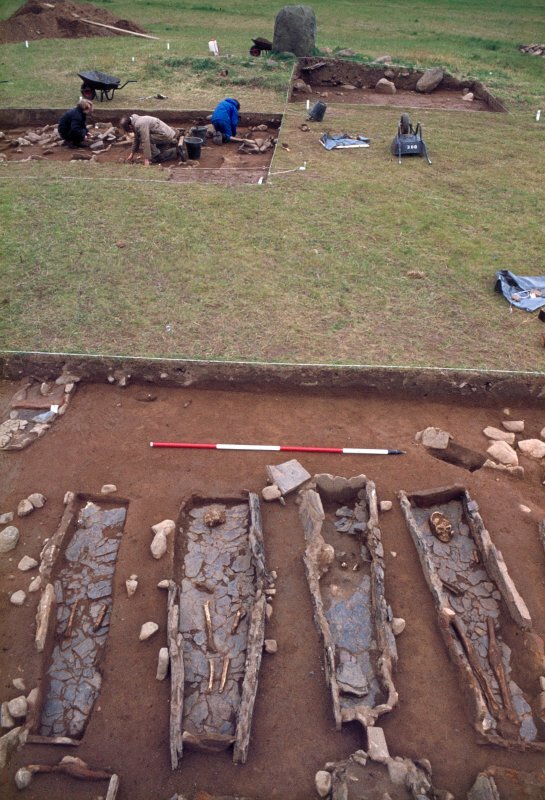 Hutchison, who carried out more extensive excavations in 1864, states that the Catstane "stood over what was distinctly the side walls of a built grave identical in masonry and material" with the short cist found in the adjacent long cist cemetery (NT17SW 2). No skeletal remains were found. 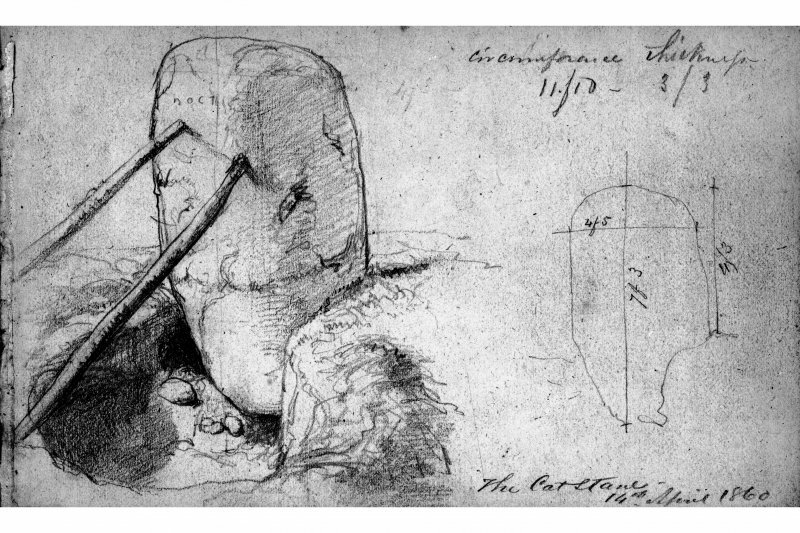 Drummond's sketches do not give a good impression of this feature, but one parallel for a rough slab-built setting within a standing-stone hole has been excavated at Orwell (NO10SW 8). On the other hand, what has been taken for a short cist may simply have been the bedding of the stone. 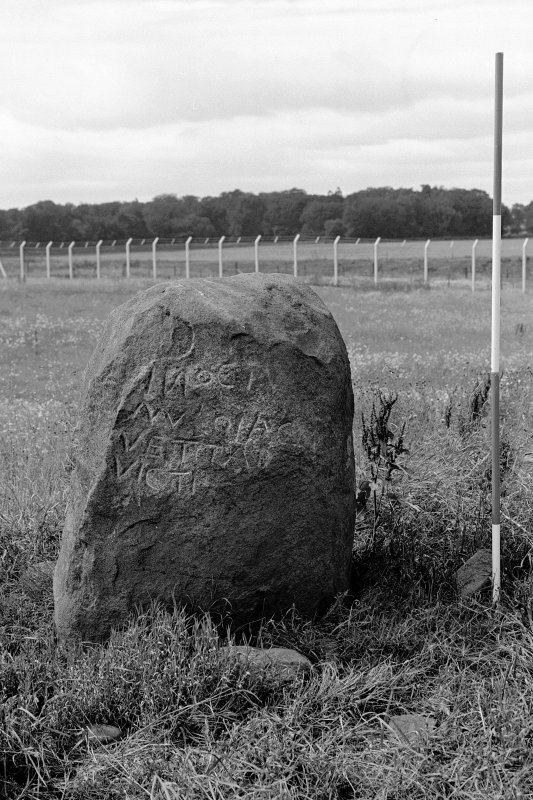 However, it is reasonable to assume that the long cists of the presumptively Early Christian cemetery follow in an area of Bronze Age activity represented by a standing stone and kerb-cairn of a recognisably second millenium BC type, the standing stone being re-used for an Early Christian inscription. J Y Simpson 1863; R Hutchison 1868; D Wilson 1863; RCAHMS 1929, visited 1915; A Rutherford and J N G Ritchie 1975. The 'Cat Stane' is as described and illustrated. 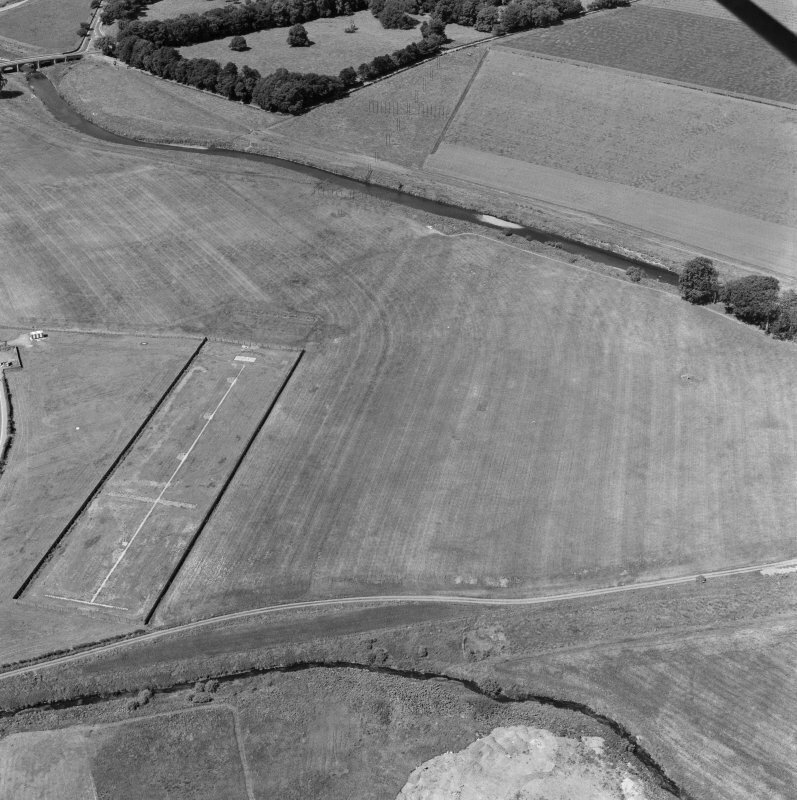 Although falling within the extension to Edinburgh Airport, it has been fenced off for preservation. 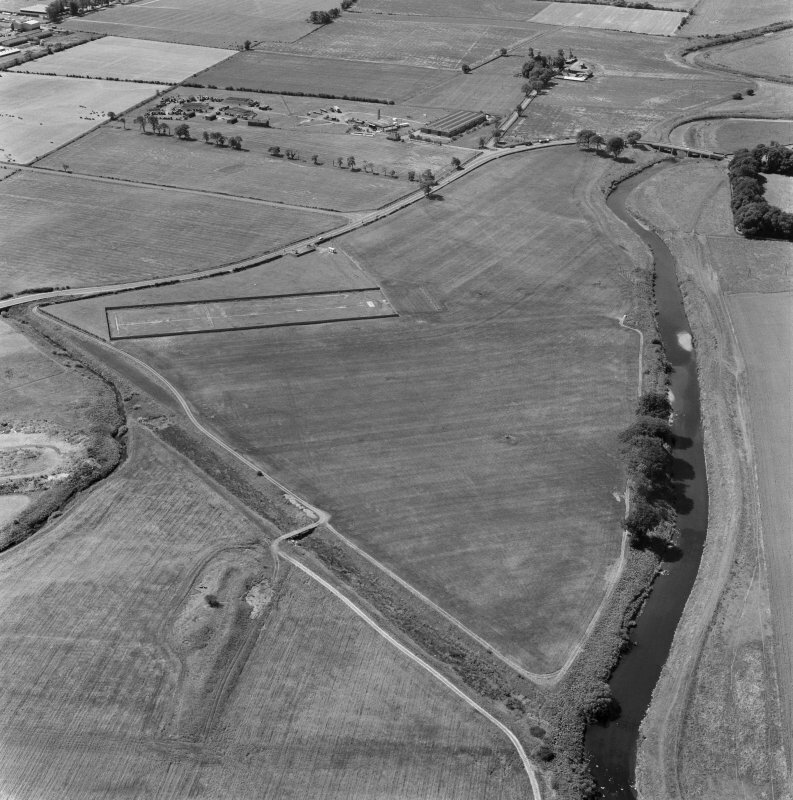 Limited excavations were carried out prior to the proposed removal of the 'Catstane' from its present position. 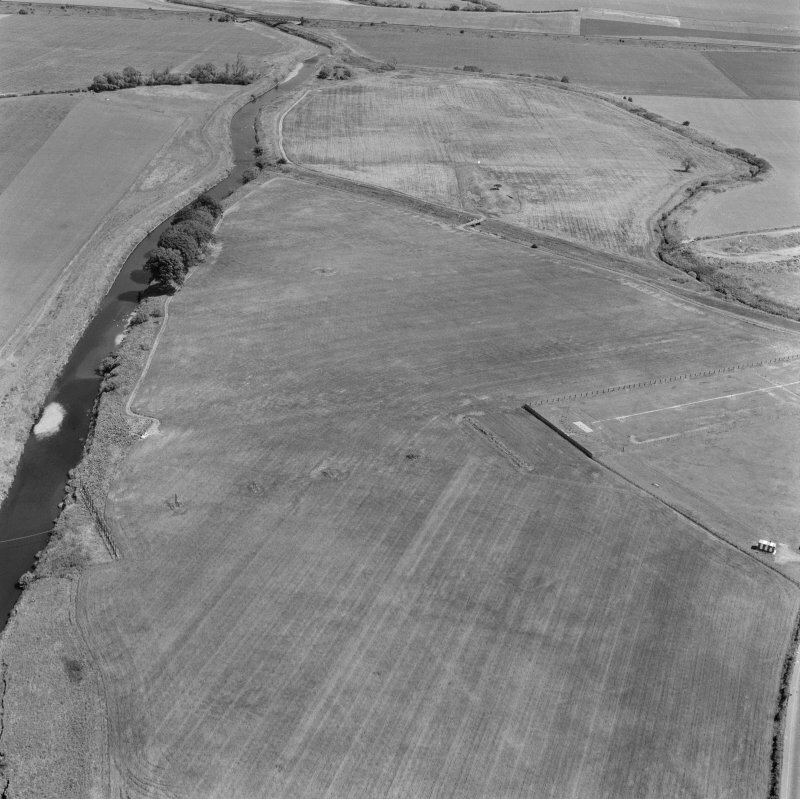 The area surrounding the stone was extensively disturbed, presumably during the 1860 excavations. An irregular trench around virtually the whole of the stone had removed all trace of the original stone-hole. The interpretation of the "stone-built grave" found at that time must therefore remain in doubt. 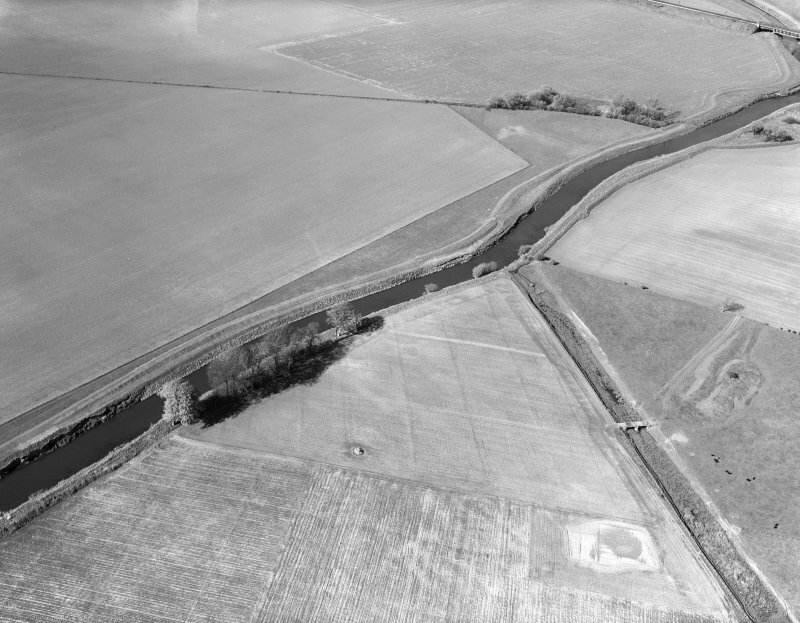 The presence of two definite stone-holes and a probable third E of the Catstane suggests that prehistoric activity along the lines proposed by Rutherford and Ritchie remains a possibility. Information from Historic Scotland, scheduling document dated 22 July 2011. 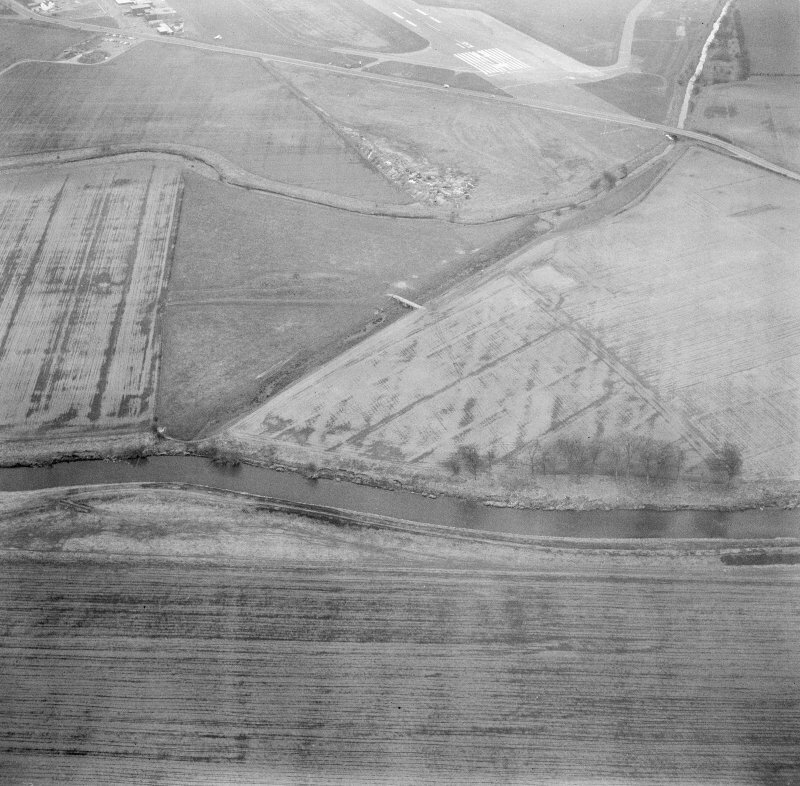 Oblique aerial photographs of the Cat Stane site, Midlothian, photographed by John Dewar in 1966. The "Cat Stane" is as described and illustrated. 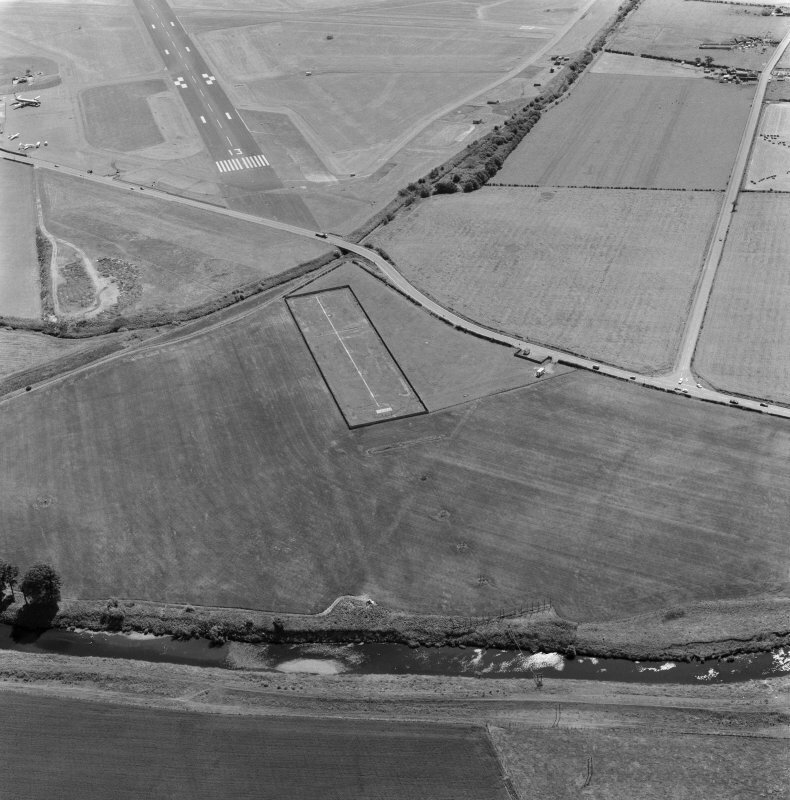 Although falling within the extension to Edinburgh Airport, it has been fenced off for preservation. 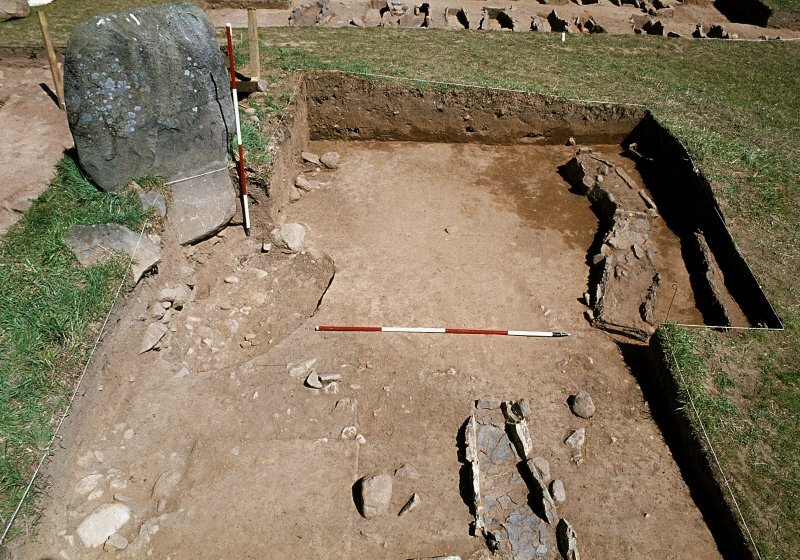 Limited excavations were carried out prior to the proposed removal of the 'Catstane' from its present position. layers of made ground containing large quantities of shale waste, and modern glass, tile and ceramics, while others cut through sand or compact clays. Shale/blaes was present on the S side of the Cat Stane. 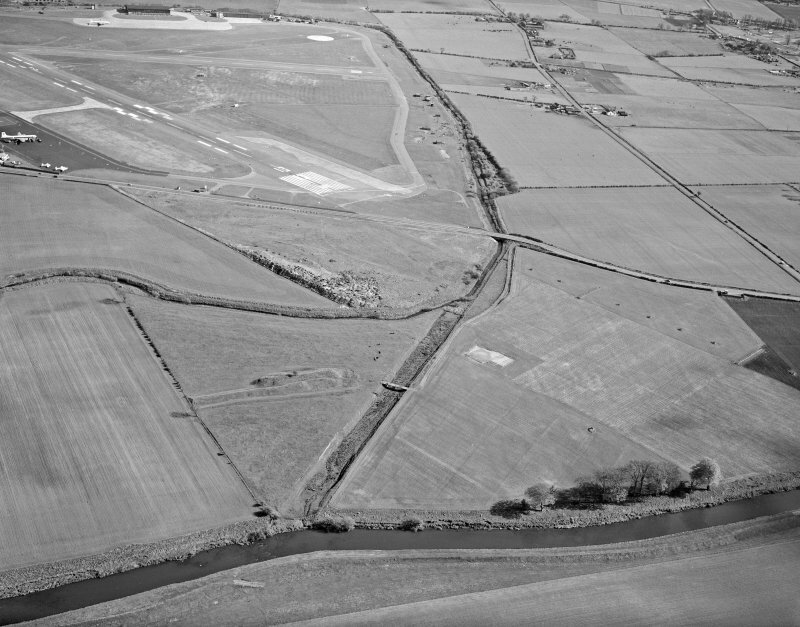 Those on the N/NW side of the scheduled area, adjacent to the modern airport access road, had the deepest deposits. 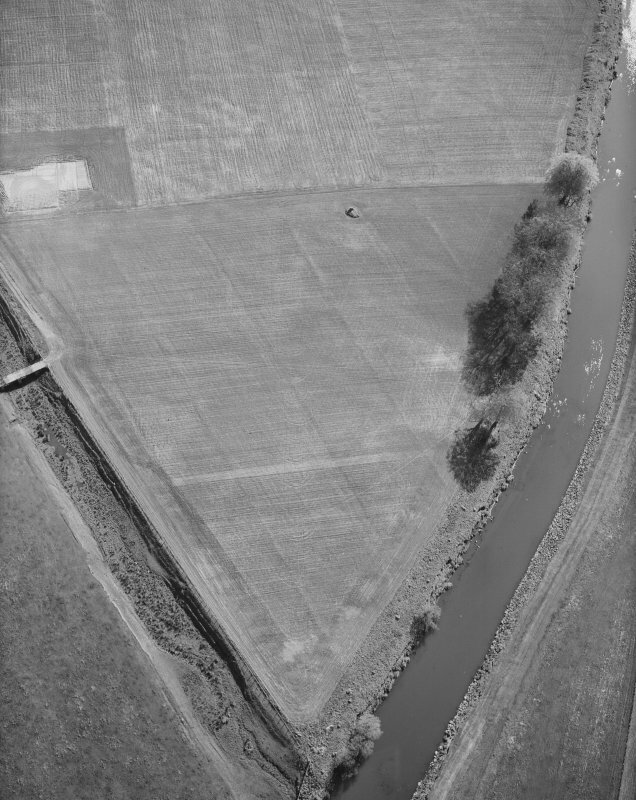 These results suggest that a considerable degree of ground disturbance and landscaping has taken place in the past, possibly associated with the former Dunnet Shale Workings or with the construction of the airport. All test pits were excavated to natural subsoil. 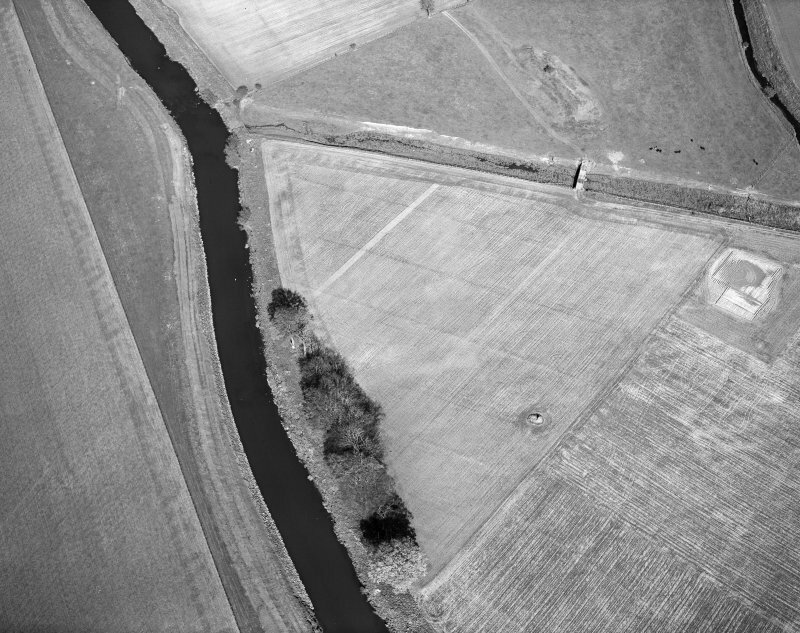 No features or deposits of archaeological significance were recorded. 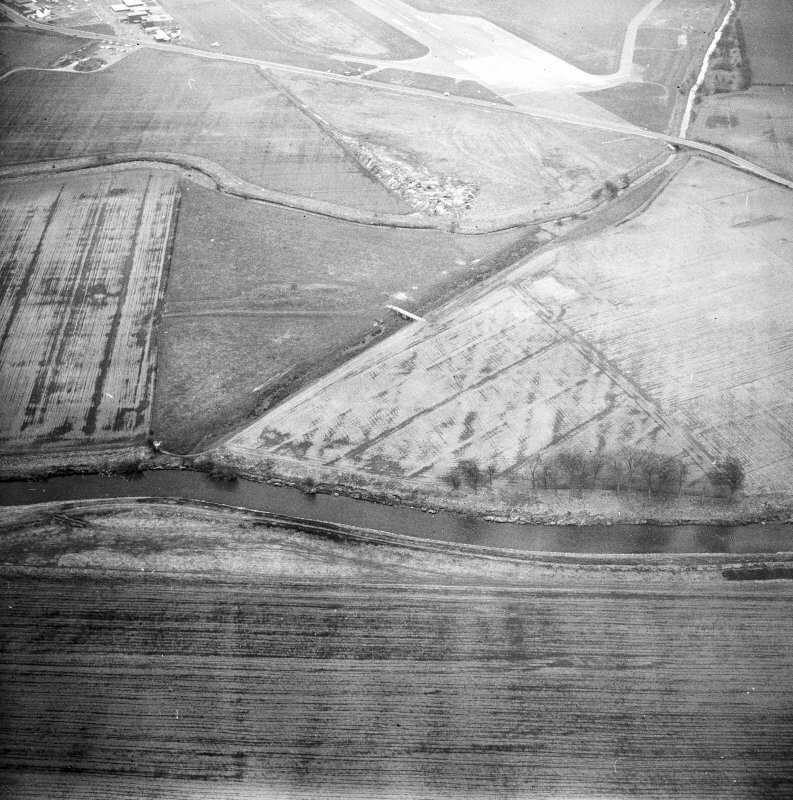 Archive to be deposited with RCAHMS. Reports to be deposited with CECAS and RCAHMS.